U.S. fire departments responded to an estimated 1,642,500 fires. These fires resulted in 3,245 civilian fire fatalities, 16,400 civilian fire injuries and an estimated $11,307,000,000 in direct property loss. There was a civilian fire death every 162 minutes and a civilian fire injury every 32 minutes in 2006. Home fires caused 2,580, or 80%, of the civilian fire deaths. Fire Safety is important for all ages. Fire District 6 provides fire safety presentations to a variety of groups in our area including preschools, elementary schools, adult groups, and senior citizen groups. 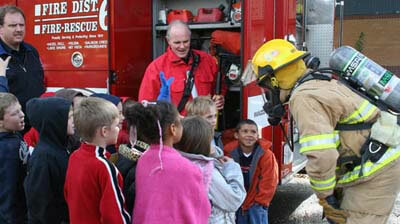 Fire District 6 provides a comprehensive fire safety and prevention program. We provide education in the schools on a regular basis. Our children will learn now what can keep them safe for their whole lives. Our senior citizen population is at greater risk of being injured in a fire. Our presentations to our senior community focus on their own special needs. Adults are always surprised at how much they learn at our presentations. In cooperation with the Hazel Dell/Salmon Creek Business Association, the District hosts an annual Fire Prevention Poster Contest for 3rd through 5th grades in Fire District 6 elementary schools. Fire District 6 conducts free Home Safety Evaluations. We can come to your home and identify fire hazards, check you smoke alarms and assist you in make you home safer.